I love to eat steak, there is nothing more succulent than a perfectly done steak. Sadly, the preferred cuts of heifer go for a pretty penny. Like most people out there, those steaks are for special occasions. For me those are birthdays, holidays, and when a day has just gone terrible. Finding the perfect steak is a tough to a job. I mean, we all aren’t steak whisperers. Becoming a steak whisperer takes time and years of quiet meditation. This is why I am not a steak whisperer. Picking out the right steak is not rocket science, it’s about being observant. Think about all the cooking shows that you have been watching over the years, they hold the answers. Fat (Marbling), shape/size, and location. First there is fat, now I could be all confusing and say this:You want just the right amount, with the right pattern of marbling throughout the steak. Which is true, but my views on the perfect the steak compared to yours, are different. In theory, a perfect steak looks like this. I did not take this photo, not my steak. When steak looks like this, it is considered to have perfect marbling, and aging. These are both common in high quality steak houses. Steaks are usually uniform due to mass production. So unless your cuts are skirt or flank, you’ll be fine. Location is important in different ways. Cuts come from different areas of the cow. Ribeye, T-bone, Strip, Filet mignon, and Sirloin. All examples of cuts of steak that can be picked up in a store. Also location of where the cow came from as well. Some states aren’t blessed with great cow farmers. You can buy the ten dollar two pack and cook it as good as a prime cut. That’s what drove me to make this, I’m cheap. I work retail, I like my job, but money is money. That means I can’t afford those super duper cuts all the time though. When using less premium cuts, sometimes you have to get creative. For this recipe I slice the meat thin. I have done pan fried steak, or of course on the grilled for this recipe. One day after work I was feeling like steak. I was searching through Pinterest for a sandwich recipe. Found one I thought would impress the wife, and started shopping. As I was gathering the ingredients I started noticing the prices. Like 7 bucks for a spread, and 6 bucks for cheese. For one dinner and never used again, that’s too expensive. I want to make sure the products i’m buying are going be used. So I decided to create these steak sandwiches. Now this gonna sound crazy, but not all Pinterest meals are practical. So my sandwiches have, steak, caramelized onions, cheese, mustard, and a blueberry lemon jam. All can be picked up for around $25 dollars. Also you need buns, and I used Kaiser rolls. The steak gets a rub of dried thyme, oregano, and salt and pepper. 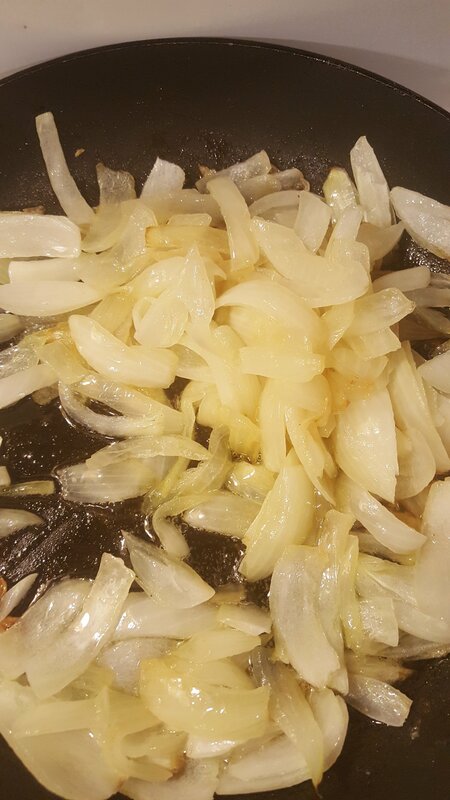 Onions transform into soft, golden brown,bits of goodness. The tangy, grey poupon mixes with the stinkiness of asiago. The onions, steak, and blueberry lemon jam play a symphony of flavors over your taste buds. This dish has worked it’s way into our monthly dinner rotation. Outside of the onions, this dish takes 10 minutes to make. When people try this I guarantee they will be questioning your sanity. After they take the first bite, you will be the best cook they know. Smucker’s Fruit and Honey Blueberry Lemon Fruit spread. The low and slow way of doing this is time consuming, but life changing. This can be done in advance and reheated. 3 to 5 minutes per side depending on doneness of choice. Preheat skilled with enough oil to coat the bottom of the pan. 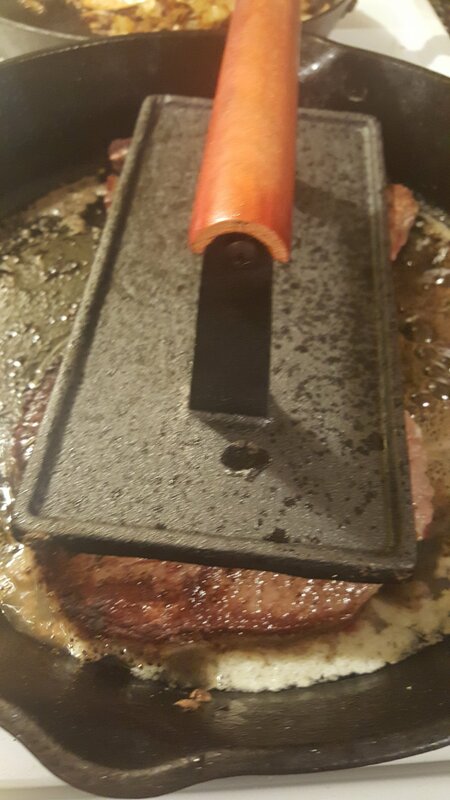 Once oil is smoking place steaks into pan. If streaks start to bow and lose contact with the pan, place a heavy object, or spatula over steaks. This will help create the nice crispy sear on the steak. Let steak rest for 5 minutes, and slice ¼ of a inch thick.